"Information is important. We bring you information." I'm a diehard NFL fan, but I don't get fantasy football. I'm perfectly capable of understanding it, but on some level it baffles me�how could I, as a Jets fan, cheer for Tom Brady, for instance, just because the Patriots quarterback was on my fantasy roster? Would a member of the Raider Nation really care to admit that he's got a rooting interest in the Broncos (or at least a Bronco) doing well? Do some fantasy football participants in Green Bay take a pass on Bears-hating just because a Brian Urlacher sack worked to their fantasy team's advantage? But it's clear, after watching just a little bit of this DVD set, what the game within the game is all about: getting football fans interested in otherwise meaningless games and teams. Only a fantasy football general manager unfortunate enough to have been stuck with the Bengals defense, for instance, could have much interest in the outcome of a couple of 2-13 teams going head to head late in the season. At a time when the television ratings for sports are steadily eroding, things like fantasy football are the stuff of Paul Tagliabue's dreams, and his league has teamed up with Warner Bros to separate their audience from their money. 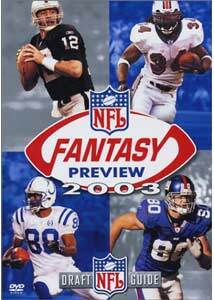 But hey, fantasy footballers, you know who you are, and this two-disc set offers a wealth of information. NFL alumni and current broadcasters Spencer Tillman and Ron Jaworski are joined by John Hansen, publisher of fantasyguru.com, and Adam Caplan, of the Pro Football News and Injury Report, in this made-for-DVD production. (Yes, it's the same one currently being hawked with Sports Illustrated subscriptions.) There's hype and hype and more hype here— 2002 was great! 2003 will be better! But there's a whole lot of information as well, and Caplan and Hansen do much of the heavy lifting. The second disc offers the next three chapters: Draft Strategy is reasonably self-explanatory, and tours you through topics from rookies to free agents to strength of schedule; next up is a Mock Draft, featuring a half dozen fantasy football devotees, followed by evaluations of how these armchair G.M.s did. Finally comes Roster Management, covering things like the waiver wire and bye weeks. The audience for this sort of thing is undoubtedly self-selecting, but it's hard to imagine what else you might need before your very own draft day. Image Transfer Review: The picture quality has the high-gloss look of the networks' Sunday pregame shows, and it seems a little garish at times; resolution isn't always as sharp as it might be. But it's more than adequate for the task at hand. Audio Transfer Review: Audio quality is on par with most NFL broadcasts�sharp and crisp, though sadly you don't have the opportunity to get in touch with your inner John Facenda. Extras Review: The menus for the five chapters are sensibly presented and are very clear; all the action is pretty much in the feature sections. These discs offer much more about fantasy football than a casual fan would ever need to know, but if you're hot to win the office pool or just to show up your buddies, it may be worth your time and money.